We are starting a new project that will see pigs as part of our rotation at the farm. Super exciting. It will be joint venture with Jennie Helmer next door. Two pigs, one for each farm, but they will live, sleep, eat and root around together at the end of our field. We have ordered two rare breed Tamworth weaners (baby pigs) from a Biodynamic farm up in the Chilcotins called Big Bear Ranch. They do great things up there raising pastured meat, so be sure to follow the link and check out their website. 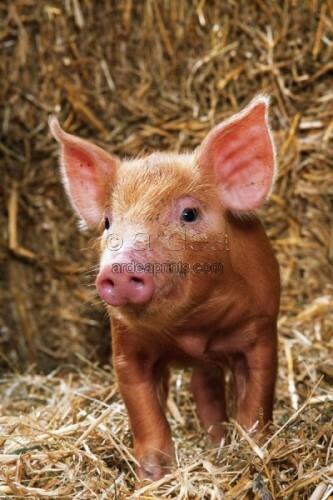 Tamworth pigs have a reddish colouring and are known to be hardy pigs, as well as lean. They are also known as a bacon breed, which is just as well as we love bacon. And so yes, that means we will be taking the plunge into butchering at the end of the season. This will be huge in more ways than I can imagine right now, but as we currently eat meat and even though we do our best to know the producer of the meat we eat, we feel it is time to take the next step towards being connected with our food. We will post some photos when we have the little guys, which we expect to be in late April to mid-May. OMGGGGGGGGG. Why, oh why did I ever leave that province? I could be driving up to visit your lil’ piggies! Hi Sarwar…….oooo, how gorgeous is he???? Hope you guys are well – is it warming up just a little bit?